It looks like we won't have to do much explaining about how someone named Stewart could claim an ancestral connection to Poland. 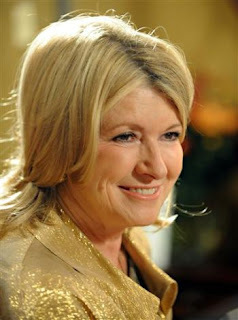 Cousin Martha Stewart (not a blood relation) is in Poland this month and is knocking them dead, in anticipation of the Polish version of her magazine. And she's not a Polish poseur, making the best of some slender genetic connection. Martha claims four Polish grandparents, three more than I can (and mine was Jewish, which I'm pretty sure would not count to some Poles). Turns out her maiden name was Kostyra. Best of all, Martha grew up on "pierogies, the traditional Polish stuffed dumplings; kielbasa, the Polish-style sausage; and babka, a spongy yeast cake popular at Easter." It's good to know that she's not all about fashionable food like sprouts and polenta. This changes my whole frame of reference for Martha. Correction -- One of those tedious truth-in-information types, who happens to be a friend, advises me of the consensus view that the Howard Dean-tortures-a-cat photo recently featured at this site is a computer-generated fake. OK. We take it back. We're sorry. Still, it's a great fake. Which reminds me of a great Thaddeus Stevens line (there are so many, apt for every occasion). So, Lincoln asks Thad if the guy he's about to appoint War Secretary is a thief. Thad says, "He wouldn't steal a red-hot stove." The guy hears about Thad's remark and demands a retraction. Thad agrees. Next time he's with the president, he reminds the president of his earlier remark about the War Secretary candidate. "I now take that back," he says.